With the ever increasing number of commercial and residential properties in the United States comes a rise in the demand for professional electrical services. Whether you’re looking at having landscape lighting installed, creating an electrical system for a new building, or getting your ground fault circuit interrupter repaired, the best way to do it is to hire a reliable electrical services contractor with a wide range of expertise and many years of experience in the industry. Few names come to mind when it comes to truly efficient and dependable electrical services in Garland, Texas, and one of them is Pettett Electric. We have been in business for over thirty years, a testament to our commitment in providing only outstanding services to those who repose confidence in our work. Our customers depend on us to provide them expert services, including electrical works for homes and business environments, lighting retrofits, energy-efficient electrical services, safety inspections, emergency power services, as well as electrical system installation and maintenance for new construction and remodelling projects. All customers are entitled to free service quotes. If you want to learn more about our myriad of services, please call us today at 972-388-3560 or write to us through our contact page. Our highly trained and accommodating electrical experts can help you get started on your projects as soon as possible. Part of the Dallas-Fort Worth-Arlington Metropolitan Statistical Area, the city of Garland is situated in the northeastern region of Dallas County in the state of Texas. Garland, TX was first inhabited in the 1850s, although a cohesive community didn’t exist until the 1870s, when the two competing settlements of Embree and Duck Creek emerged. In 1887, a post office between the two towns was established, a move which united the residents of the two communities and gave birth to the town of Garland. The new community was formally incorporated in 1891. 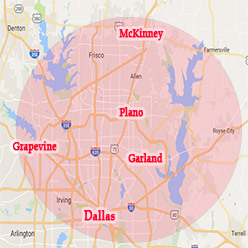 Today, more than 234,000 people live in the modern city of Garland, TX. Its residents benefit from the city’s thriving, stable, and diverse economy.